The vintage whiskey barrel that each ®Reel Barrels product is made from measures 36” tall x 24” in diameter at its widest point in the center. 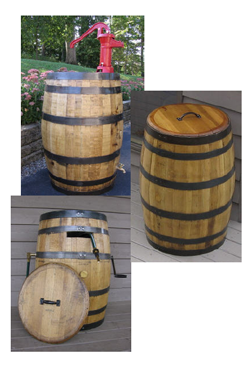 The top and bottom diameter is 21” and the barrel staves are made from 1” thick American White Oak. This type of quality construction creates a storage accessory that weighs approximately 120 lbs. Due to the weight and size of our products we must ship via freight carrier. Please be sure to read the delivery information contained on the Delivery Page on this sight. We recommend that you have your purchase delivered to a business address or that you choose to pick up your shipment at the freight terminal. We make this suggestion because freight carriers apply additional charges for residential delivery. Freight terminal pickup is available in most areas at no additional charge. Please contact ®Reel Barrels directly at [email protected] to obtain an accurate shipping quote. If you do opt for residential delivery, you must provide us with your name and contact phone number for the carrier to arrange the delivery. There must be an adult present to accept the shipment when it arrives. Carriers will only make one attempt to deliver to a residential address. We welcome inquiries for wholesale pricing. If you are a nursery, equestrian facility, conservation organization, municipality, Federal or State Park, or any other environmentally conscious organization, please contact us for quantity discounts and special pricing.